From this undirected mindless evolutionary process he is saying novel structures, like gills and eyeballs can arise, and many times over it seems, therefore the naturist can also speak of purpose (a giraffe has a longer neck to get leaves on higher branches) and of information that arises from the vacuum. He agrees with other atheists, like Dawkins, that underlying it is mechanistic and mindless but he is trying to add a poetic gloss. But here in keeping with evolution speak the type of ‘purpose’ is only useful for the domain it applies to. Despite the fact that science has absolutely no robust theory how stars and galaxies form naturistically, which he uses for his comparison, his claim is that purpose and information also arise from nothing. From the universe, not the Creator, within the laws of physics anything is possible. This is his message. How do we know? Because we have observed the big bang, and the formation of stars and galaxies, the cooling of the planet Earth, the spontaneous origin of life, and the development of the pageant of life on the planet over the past 4 billion years. That sounds like Gaianism—that the inherent force (he calls his the initial conditions of the universe) to ‘create’ everything was foreordained by the universe. Information is conserved and therefore it was written into the configuration state of the big bang. The information content to make giraffes then was already existing in the big bang. Such are the depth of belief needed by the atheopaths. Then follows a discussion about theistic evolution. Here I found myself agreeing with one aspect. In the 1990s a dispute developed with the National Association of Biology Teachers (NABT) over their definition of evolution. It was resolved by removal of the words “unsupervised” and “impersonal”. Carroll argues that the original wording was scientifically accurate, which included those words. Yet the only reason they were removed was because of the belief by some US teachers in theistic evolution—that is, that evolution was subtly directed by an unseen force or by God’s hand. There are those, like Francis Collins, director of the US National Institute of Health and Kenneth Millar, a cell biologist, who support this view. Both have actively campaigned against teaching creationism in American schools. They both claim to be Christian, maybe the same type that Carroll was before his own conversion to naturalism. How can he use the word ‘easily’ here? First you would have to be able to calculate the probability of humans appearing. How could that be done? Sample a million universes? It is, to a high order, ludicrous. But within the evolution mindset everything evolved, so there is no need for a Creator. From that perspective I agree with his logic but not his starting premise. Theistic evolutionists have no scriptural basis for their belief; they base it on the flawed assumption that evolution happened, from the big bang on. That means cosmic evolution to biological evolution. Nevertheless from the biblical standpoint, God is very clear that He created man, Adam and Eve, in His own image and it was at the beginning of creation, 6000 years ago, not after 14 billion years of evolution. Matthew 19:4 and Mark 10:6. Also I agree that resorting to quantum mechanics or quantum indeterminacy as a way to get God in there (i.e. God made the correct quantum choices) is flawed because the results would be detectable by observations. Quantum mechanics is probabilistic in nature but because of the very large particle numbers on any human scale it is as deterministic as is classical physics. I agree with this statement because theistic evolution removes God from His rightful position as Creator. It makes Him almost invisible. We need to acknowledge the laws of physics as the creation of God. He only intervenes or breaks/suspends them on very specific occasions, which are significant events. These are healing miracles, raising from the dead and most significantly the resurrection of the dead, starting with the resurrection of the Lord Jesus Christ. But God does not work over billions of years through a process of death and suffering to create new animal and plant species. That is just nonsense. Next Carroll deals with the ‘fine-tuning’ argument, also called the ‘anthropic principle’ for the Universe. In that argument, it is advocated that the restrictions placed on the range certain parameters in the natural world could take make them finely tuned for life’s existence. For example, the mass of the electron could only take on a value within a very narrow range else life could not exist. And so on with the range of operation of the laws of nature. However he also admits that “fine-tuning is probably the most respected argument in favor of theism.” (p.303) That is because the argument plays by the same rules as naturalism—through making predictions and testing them by observing the world. But the argument relies heavily on what we already know. This is one point I agree with him on, but for different reasons. There is only one world. 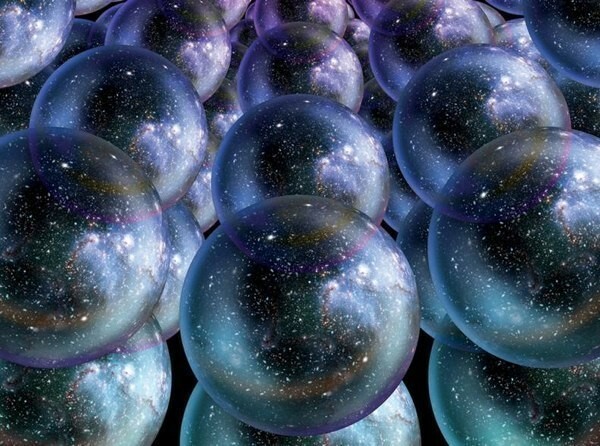 There is no multiverse of universes and the big bang evolution story is a fiction. So there can be no comparison between true arguments for theism and naturalism. Only if you accepted the big bang origin for the Universe along with the argument that the laws of physics are a property of that universe’s cosmogony (its particular origin) and only if you accepted the naturalistic origin of life and the subsequent evolution of life can the two belief systems be compared. The big bang is as much a belief system as is any religious notion of origins. So the fine-tuning argument be a backdoor to naturalism entering our belief system and this is essentially what has happened with biblical apologists like Hugh Ross and William L. Craig. But his selection effect argument also is weak because it also assumes a priori that the big bang evolution story is a fact. For example, to argue that rate of expansion of the early universe was finely tuned to our current existence, assumes everything after the big bang in that naturalistic story to be true. It even assumes that the universe expanded or is expanding. Neither of which is an established fact. In fact, it cannot be established beyond doubt because there is no experiment you can do on the Universe, unlike experiments you can do in a laboratory. He cites the famous ‘cosmological constant’ problem, which is a big-bang-only problem. It is not a problem for biblical creationists. According to theoretical quantum physics and experimental observations, it is reasoned that a true vacuum still contains a small amount of energy—energy intrinsic to the vacuum, which can be understood in terms of a sea of ephemeral virtual particles continually popping in and out of existence for a very brief period. But also from Einstein’s general relativity theory, which underpins big bang cosmology, a cosmological constant (represented by the Greek letter Lambda, Λ) has been used to get cosmology theory to fit astronomical observations. It is believed that Λ is some sort of vacuum energy driving the acceleration of the alleged expanding universe. But the value calculated for this alleged ‘vacuum energy’ from cosmology is about 120 orders of magnitude smaller than the value calculated from particle physics. So the argument is made that if the ‘vacuum energy’, represented by Λ, were equal to the particle physics calculation then nothing would exist. Individual atoms would have been ripped apart from one another. The fact that it is ‘actually’ so much smaller is meant to be life-affirming. The smaller value is calculated from cosmology, which as I have shown, is not experimental science. The flaw in the argument is two-fold. One is that it assumes the cosmological constant Λ is actually real, that it is correctly included in the correct solution of Einstein’s field equations used to describe the alleged expanding universe. Thus the cosmological constant is responsible for an acceleration of the expansion. One line of evidence suggests otherwise.1 And looking at all the evidence for an expanding universe we find it equivocal.2,3 It is not clear, but it might not be expanding at all. The second is that it assumes that the cosmological constant describes vacuum energy and that it is understood how to correctly calculate the energy density of the latter. The latter Carroll acknowledges as a problem. And only if these points are overlooked is there a fine-tuning argument. And though he admits it a remote possibility, he does not rule it out. But this is truly science fiction, not reality at all. It is the logical end where the materialist’s mind must go. He says another complication is that we might live in a multiverse—that is in one universe of an infinite number of universes (see Fig. 1) where each has slightly different physical constant from another.4 Thus the fine-tuning argument, or, the anthropic principle, as it often called, is a non-starter. The logic goes like this. Of course, we would think our universe to be fine-tuned because we find ourselves having evolved in this one, where there are many others with different values for the fundamental constants where life could not evolve. This argument is not science; it is untestable fantasy, and an appeal to an alternate belief system to satisfy one’s desire to explain the world around us without a Creator. It is also contrary to Carroll’s methodological empiricism. The theories that are doing this forcing are string theory and cosmic inflation. String theory5 is current the best theory to unite gravity with the quantum world. But physicists have been working on that theory now for at least 50 years with not a single prediction that has been experimentally testable, let alone an actual laboratory test. The closest we might have is the tests of supersymmetry theory6 (or SUSY for short), a sort of offspring of strings theory. That theory has recently be ruled out by 10 years of particle physics tests with the Large Hadron Collider (LHC) on the border of Switzerland and France.7 One of the winners of the 2004 Nobel Prize in physics, theoretical physicist David Gross, a leading string theorist,8 along with others, has been forced to admit that supersymmetry is a dud. Yet Carroll admits that there are at least 10500 different implementations of string theory—of which it is not known where to look for the real physics of the real Universe. In reality string theory rightly belongs in the mathematics department—it is not physics. String theory posits the existence of many more spatial dimensions than the three (length, breadth and depth) we observe in this Universe. Depending on the string excitations it has 10 or 26 spatial dimensions in total, but the number is uncertain. According to the theory, we don’t observe the extra dimensions because they are curled up making them too small to observe in the macroscopic world. So string theory is a mathematical speculation about the cosmos, which allows for a multiverse. It might be considered a prediction but with 10500 possible predictions it is hardly very prescriptive. Certainly it is not a physical theory at all. We agree that no direct evidence for cosmic inflation has been observed. In 2014 it was claimed by the BICEP2 astronomers but that had to be retracted a year later.10,11 When the BICEP2 team made their announcement it was suggested that the inventor of inflation, Alan Guth, was in line for a Nobel Prize. But that quickly turned out to be premature.12 Level heads eventually admitted that dust in our galaxy was the true source of the putative signal they claimed as evidence. 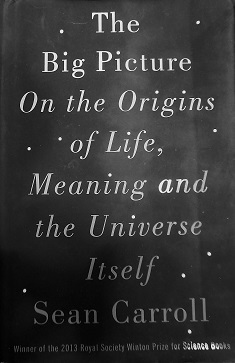 He finishes this chapter with his formulation of what the Universe should be like if the existence of life (or human beings) was the primary consideration in its design. He outlines three features. He states that in our Universe “the entropy is far lower than it needs to be just to allow for life…. There is no reason for God to have made it so small.” But how could you know that? He bases his argument on naturalism—that life just naturally evolved. How can He know what the Creator God was doing at creation? It is setting up a straw man argument against God. “If I was God I wouldn’t have done it that way, because it is not necessary.” Then using such a line of argumentation to prove the initial thesis, that there was no Designer. He argues that there are two heavier families of particles which are not involved in life it indicates that creation was not from a Designer but from atheistic naturalism. But again he creates a straw man. He assumes the role of knowing the Creator’s mind and then, because by his definition, a creator would not do it that way, it make much more sense to favour godless naturalism. Firstly his language automatically assumes Darwinian evolution to be true without any direct empirical evidence. Secondly, he again assumes he knows the mind of God. Thirdly, he knows nothing of the revealed will of God, who has told us that the ‘heavens declare the glory of God’ (Psalm 19:1). It is, at least, naïve to think mere humans can know how the Creator should think. But to use such a false argument against the existence of a Designer or against theism is fundamentally flawed, because it does not start with the correct initial conditions, but assumes a certain naturalistic initial state, without proof. 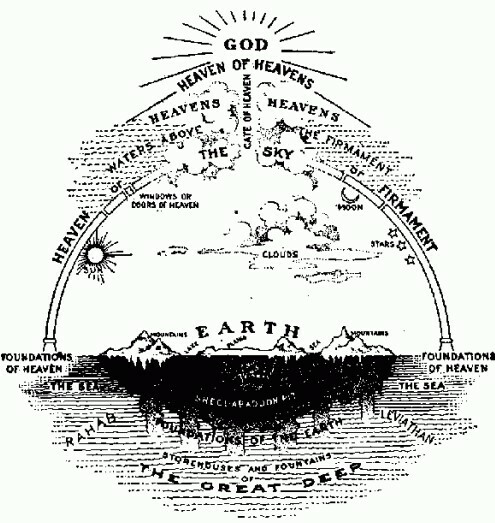 Figure 2: An alleged ancient Hebrew conception of the Universe. This is patently false. Biblical theism—the type that follows scripture as the authoritative revealed words of God—predicts that all the stars in the Universe are there, and that they were primarily created for God’s own glory. The Universe is incredibly large, so perhaps God was trying to give us a sense of His greatness, as He is so much greater than His own creation. Here he assumes his premise (it is easy to make a universe like this one from nothing by naturalism). Thus the conclusion is that there is nothing for the Creator to do. So why believe He made it? Then he argues that the prescientific cosmology of the Hebrews was an Earth-centred universe with the cosmos a solid dome, supported by pillars above the earth. See Figure 2. Thus he argues that that this is what theism predicted. But true theism only predicts what the Bible contains within its pages. Primitive representations like the one he describes do not accurately predict the greatness and power of the Creator. He is a great God, above all gods (Psalm 95:3), who has power over all forever (1 Peter 5:11). He is the omniscient, omnipresent, Creator God, (Psalm 139:1-6) and such representations limit God by the miniscule imaginations of man. God made all the billions of billions of stars but, of course, the early Hebrews were limited in their scientific knowledge. So we cannot ascribe to God something that is due to the limited astronomical knowledge of their time. But there are many accurate predictions from the Bible that have been verified in the last 200 years. Now the new atheists would have you believe that they have more knowledge than their own concept of God. They would have you believe their new religion—that the Universe created itself. See Figure 3 below. In that cartoon the word ‘Hallelujah’ is out-of-place because it means (from Hebrew) ‘praise to Jah’, where Jah is short for Jahovah, the name of the one and only self-existent Creator God, who is uncreated and created the Universe. 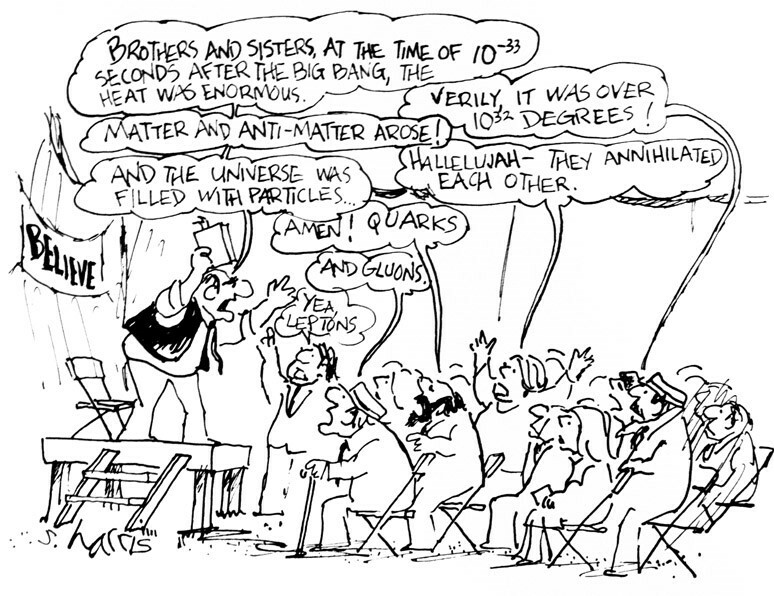 Figure 3: Cartoon from Sidney Harris, “Einstein Simplified” taken from Cosmology and Culture, Joel R. Primack. Click here for Part 10 of this review. Hartnett, J.G., Is there definitive evidence for an expanding universe? August 19, 2014. Hartnett, J.G., Is the Universe really expanding—the evidence revisited, July 29, 2016. Hartnett, J.G., On the origin of universes by means of natural selection, October 9, 2014. Hartnett, J.G., SUSY is not the solution to the dark matter crisis, August 30, 2016; Journal of Creation 31(1): 6–7, 2017. Along with Jeffrey A. Harvey, Emil Martinec, and Ryan Rohm, David Grosse formulated the theory of the heterotic string. These four theorists have been called the “Princeton String Quartet.” In 2003, Gross, an atheist, was one of 22 Nobel Laureates who signed the Humanist Manifesto. Hartnett, J.G., Cosmology’s Achilles Heel, Chapter 7 of Evolution’s Achilles’ Heels (CBP); June 30, 2015. Hartnett, J.G., Has the ‘smoking gun’ of the ‘big bang’ been found? March 20, 2014.